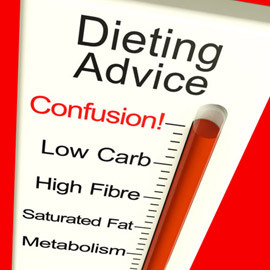 You're trying to lose weight and eat sensibly, but you're constantly hearing conflicting advice about what you should and shouldn't eat .... needless to say we're left in a tizz! I invited members to send me any dieting food claims they'd heard and I would do my best to try and separate the facts from the fiction to clear up any confusion! Is there such a thing as eating too much fruit? I heard it can be bad for your teeth. We should all be aiming for at least 5 portions of fruit and veg each day - eating more than this is a good thing, but as with all foods, you should bear in mind that too much of anything isn't always good. A combination of different types of fruits and vegetables (think a rainbow of different colours) is the best approach. Having excess fruit in your diet may have a less favourable effect on your digestion, and as fruit is acidic, it may have a negative effect on your dental health. The best approach is moderation in all things - but make sure you are getting enough fruit and veg. Dental care is also very important, so if you are someone who snacks on fruit a lot, you may want to consider a sugar free gum in between meals, and of course, a proper brushing / flossing regime too. Is it true that prawns are high in cholesterol? Yes prawns do contain a relatively high level of cholesterol. HOWEVER we now know that the cholesterol in things like prawns and eggs (dietary cholesterol), actually has very little effect on blood cholesterol. In fact it is the amount of saturated fat in our diets which is more likely to affect our blood cholesterol levels. 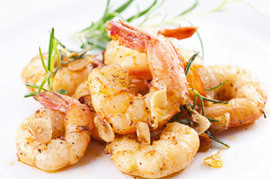 Prawns are a low fat high protein food which are a great choice to include in any diet. If you have raised blood cholesterol, cutting back on foods high in saturated fat such as cheese, fattier meats, pies, cakes and pastry etc may make more difference to your blood cholesterol than cutting out prawns. Please could you provide some examples of serving sizes? I never know how much to give myself. Portion control is often one of the main reasons that people overeat without realising. There is advice about portions on our site for many of the food items such as a small portion of potatoes, or a medium sized steak etc. The best way to understand the impact of portion size is to weigh out everything that you eat and by doing this; you can see which foods are contributing the most calories to your daily intake. If one particular food is contributing a lot to your daily intake, try reducing the amount you eat to cut down on calories. Another good tip is to buy smaller plates - might sounds simple but it really does work. If you always fill up your plate, having a smaller plate will mean fewer calories. Is it true that we shouldn't eat any type of food after 6pm at night? There is no evidence at all to suggest that we shouldn't eat past 6pm and this is for any food including carbs and protein. The important thing is that you stick within your calorie allowance over a 24 hour period which fits in with your own personal routine. So if you don't get in from work until 8pm and you then have to cook and eat, it won't make any difference to your weight loss plan as long as you haven't overeaten the rest of the day, or snacked (and not recorded!) whilst you're preparing your dinner. You need to be aware of your triggers! So if you know that you're someone who always grazes in the evening, then you might want to impose a 'post 6pm' limit to break the habit. Alternatively save some 'evening snacking' calories for later on at night - whatever suits your own personal situation. Although eating later in the evening shouldn't affect your weight loss, you should always think about the types of foods and drinks you're choosing and whether it will affect your sleep pattern etc. Is olive oil still fattening even if it is 'better' for you than other oils? What are good fats and bad fats? Yes - olive oil contains exactly the same number of calories as any other type of oil / fat. In terms of calories, there is no difference between olive oil, butter, lard, sunflower oil etc. The difference lies in the type of fat that each of these oils provide. It's all down to blood cholesterol - fats that are saturated e.g. butter, lard, the fat on meat etc, can lead to a rise in bad cholesterol, also known as LDL cholesterol. A raised LDL cholesterol level can mean an increased risk of heart disease and stroke. We tend to call these 'bad' fats. Fats that are unsaturated e.g. olive oil, sunflower oil, fats in vegetables such as avocados, oily fish etc. decrease the level of LDL cholesterol, and can increase the level of good cholesterol (HDL cholesterol). So having more of the unsaturated fats can have a positive effect on heart health. We tend to call these 'good' fats. This is why olive oil is said to be good for you - but remember that it contains a lot of calories so still best to use it sparingly! Still have some unanswered questions? Check out Part 2 and 3 for Calorie Claims and Exercise Doubts.